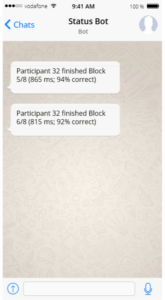 Sending Telegram notifications might be very useful for receiving status messages, f or example about participants performance during an experiment (see on the right). Getting this to work is remarkably easy – from a coding perspective. You will need around 10minutes to set up the bot prior to this. Te beauty is, you do not have to install any additional software on the experimental computer or your smartphone (provided you already have Telegram). If you don’t have it, get the Telegram Messenger now. Then, follow steps 1 and 2 from this great tutorial to create a bot (only takes a few minutes). make sure you note the authorization token and your chat ID. Then come back here. So in principle you just have to replace %TOKEN% and %CHAT_ID% with your values and replace %TEXT% with the text you want to send. Again, just put in your token and the ID and then, once initialized (put it in an inline script in the beginning of your experiment), you can call the funtion from any place in your experimental script by using bot_sendtext(Message) , for example bot_sendtext('The participant has finished the experiment') . You can use Markdown to format the text. Alternatively, find more options in the powerful Telegram Bot API. Using this script to send status about the participant’s progress in OpenSesame is super simple. Just include the following code (additionally to the method from above) in an inline script right before the feedback item. Make sure to paste the code in the run phase. The script assumes that you log participant number, mean RT and accuracy in the default OpenSesame variables. The results should look similar to the screenshot above. If you have more suggetions, I will gladly add them. Previous story Can we learn to ignore objects in our visual field?